With a date comparison set up, you can now map your value to an Infowise Indicator field for use on dashboards. This will allow users to easily see when dates are approaching or run over a deadline. In your list settings create an Infowise indicator field named On Time. Use the KPI Display mode setting. 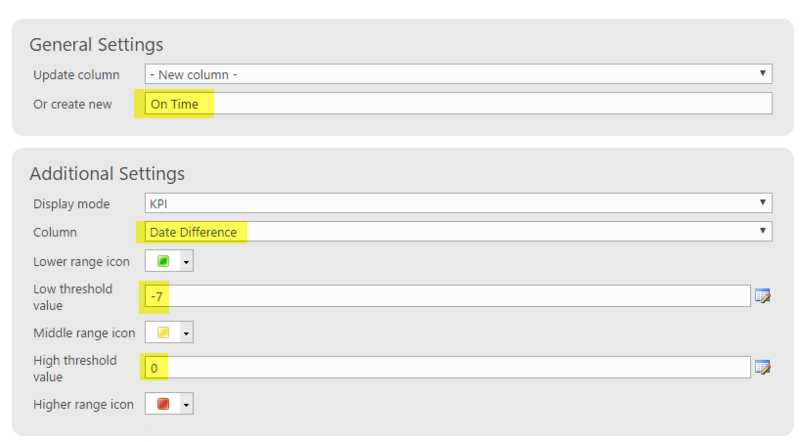 Set the column as your previously created Date Difference field. Set the Low threshold value as -7. Set the Hight threshold value as 0. Choose appropriate icons to indicate the low value (before deadline) as good and the high value (over due) as bad. KPI indicators are well liked by all users. With large projects, there are often many dates that need to be tracked. Using the Infowise indicator allows you show users which dates are in the expected range using colorful icons that make an immediate impact. Indicators are useful for tracking differences between monetary fields, dates and other measurements.